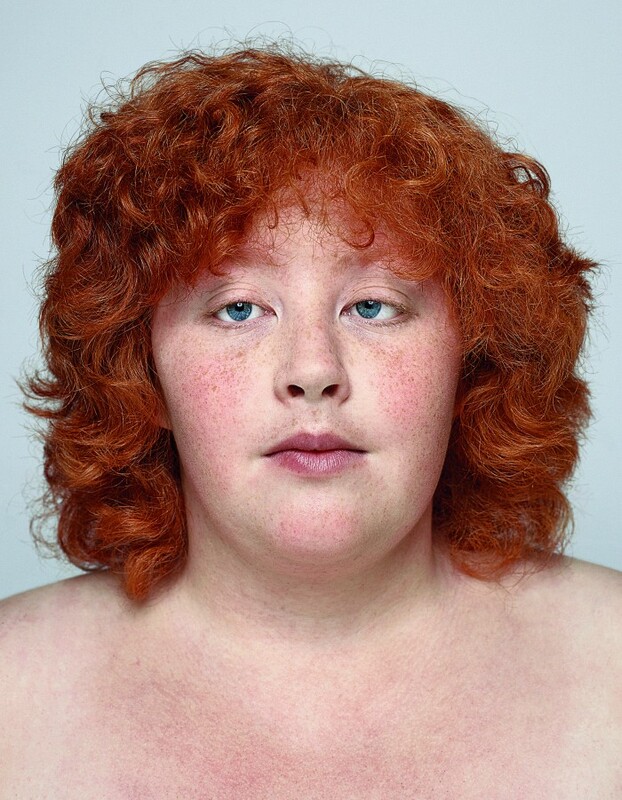 The Beautiful Gene is an editorial project focusing on the possible effects of artificial insemination on human kind: the extinction of red haired people. In September 2011 the world’s biggest sperm bank stopped accepting red haired donors for a period: demand for them was too low compared to the supply. After being scorned, persecuted and marginalized for centuries, could redheads now begin to be eliminated in a conspiracy of online questionnaires, aseptic clinics and frozen sperm? Acting as a conservation geneticist, Marina Rosso classified the genetic variation of a species, in the first step to preserve its diversity and components. 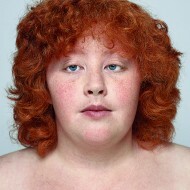 Rosso started by creating a matrix that would represent the red hair gene through 48 categories, each uniquely combining this feature with five more physical traits (gender, height, build, eye color and hair type). Then she set out on a journey looking for real people who could literally embody these categories. Marina took 204 portraits and later selected 47 of them. One category is still missing. The Beautiful Gene was exhibited in Italy at Fondazione Sandretto Re Rebaudengo, Turin (February 2014), Museo della Scienza e della Tecnologia, Milan (April-March 2014), and Officine Fotografiche, Rome (March-April 2015). This exhibition was produced by Circolo dei lettori, Turin, Italy. Fabrica is a communication research centre. It is based in Treviso, Italy, and is an integral part of the Benetton Group. Established in 1994 from a vision of Luciano Benetton, Fabrica offers young people from around the world a one-year scholarship, accommodation and a round-trip ticket to Italy, enabling a highly diverse group of researchers. The range of disciplines is equally diverse, including design, visual communication, photography, interaction, video, music and journalism. Fabrica aims to inspire a specific creative category of young “social catalysts” who, at the end of their experience at the centre, will continue their work independently. Today more than ever, Fabrica’s research is a cross-disciplinary commitment wherein communication interacts with other vital sectors like the economy and social and environmental sciences and, through continual experimentation, is alert to the changes and trends of modern society. Directed by Enrico Bossan, Fabrica’s Editorial Area, investigates social and cultural change through researching. The challenge is to cover the unseen, the forgotten, and the invisible. The area publishes and distributes books, journalistic reportages, photography projects, narrative works, multimedia and video documentaries.